The campsite provides pretty 2 person HOUSE TENTS(private room) with 2 real beds inside, (single beds) which are very comfortable, including pillows and blankets. These tents are situated on typical Ligurian terraces - very peaceful and panoramic. We are a perfect stopover for backpackers, cyclists and walkers who plan to visit the famous National Park of 'Cinque Terre'. Ideal for sea and nature lovers, we are only 3 km from Deiva Marina and its nice beach (a free shuttle bus is leaving directly in front of Deiva Marina' train station). We are also an excellent point of departure for trips on foot and by bicycle and for trekking in the unspoilt countryside of the woods in Liguria. Excursions you can take from our property: Cinque Terre, Portofino, Portovenere, La Spezia, Genova (aquarium), Pisa, Lucca, Carrara (marble quarries). Every time I stay at La Sfinge I enjoy being there very much. The staff is very friendly, the campsite is well maintained and clean. Lovely and relaxing. Staff are very helpful and friendly. Would recommend! Perfect location and service. I would recommend it without any doubt. Good value for money, shuttle bus works pretty well (though running late sometimes) and they give you the schedules upon your arrival. Me and my friend stayed in one of the little cabins; they're a bit unimpressive (only room for the 2 beds and that's pretty much it) but it works if you want to visit cinque terre, portofino, etc, and don't want to spend a lot of money; no cooking facilities if you stay in the little cabins! Really enjoyed the relaxed vibe of Camping La Sfinge. It was a decent location for getting to and from Cinque Terre and the tents were more than sufficient. The only thing it lacked was a light. The place is run by really nice and helpful people. The tents are very basic (no bedside table, light, power point) but the price is great for the area. The free shuttle bus to the train station is great. The facilities are very clean. Guests were mostly from outside Italy. Some young couples but mostly retirees. Close to a well-stocked supermarket. Not very far from the 5 towns, to get to Riomaggiore (thr closest town) will cost you around €4. Beautiful location. Restaurant and grocery store a minute's walk down the road. There aren't any power outlets in your cabin but they will let you charge stuff at the main desk. Very friendly staff. 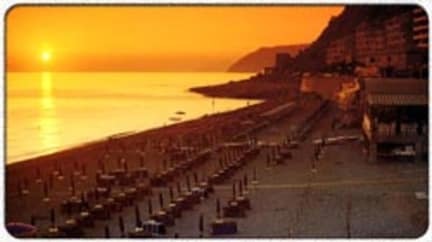 Buses run until 23.05 from Deiva Marina town back to the campsite. Overall I'd recommend to a friend. Super humid tents. The tents have huge holes in it so get prepared to sleep with mosquito families and stink bugs. The tents trap in all the moisture so your clothes and belongings get wet. Bruh. Just show us on a map where the campsite is. The attendant is gone for every person that comes in because she walks the huge campground to show the location to the person. Besides that it's dirt cheap, so if you like that, then do it.